This fifth and final volume of Lovecraft’s Collected Essays mines a rich vein of his philosophical writings. A lifelong student of metaphysics, ethics, aesthetics, and other branches of philosophy, Lovecraft early declared himself a forthright materialist and atheist. Here he defends his views in numerous controversies with colleagues. Such essays as “Idealism and Materialism—A Reflection” and the In Defence of Dagon essays outline the essentials of Lovecraft’s philosophical thought, including such issues as free will, the improbability of theism, and cosmic pessimism. In his later years, the problems of politics and economics came to the forefront of his attention. In the essays “Some Repetitions on the Times,” “A Layman Looks at the Government,” and the unpublished “The Journal and the New Deal” Lovecraft vigorously argues for a moderate socialism to relieve the widespread unemployment brought on by the Depression. The problem of art in the modern age also concerned Lovecraft, and in the unpublished essay “A Living Heritage: Roman Architecture in Today’s America” Lovecraft condemns modern architecture as an inherently ugly product of sterile theory. 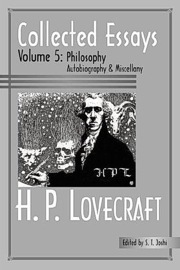 This volume also contains Lovecraft’s autobiographical essays, including the delightful “A Confession of Unfaith,” describing his shedding of religious belief, and the piquant “Cats and Dogs,” in which cats stand as symbols for the abstract beauty of a boundless cosmos. All texts are extensively annotated, with critical and bibliographical notes, by S.T. Joshi. H.P. Lovecraft (1890–1937) has belatedly achieved universal recognition as the twentieth century’s premier author of supernatural fiction. Poet, essayist, philosopher, and man of letters, Lovecraft’s work has been translated into more than a dozen languages and is widely available in numerous annotated editions. S.T. Joshi is a leading authority on Lovecraft and the author of an exhaustive biography, H. P. Lovecraft: A Life (1996). He has prepared many annotated editions of Lovecraft’s fiction, poetry, essays, and letters, along with such critical studies as H.P. Lovecraft: The Decline of the West (1990) and A Subtler Magick: The Writings and Philosophy of H.P. Lovecraft (1996). He has also done critical and editorial work on Lord Dunsany, Algernon Blackwood, Ambrose Bierce, and H.L. Mencken. Catalogue of Prov. Press Co. Collected Essays, Volume 5: Philosophy; Autobiography & Miscellany. By H.P. Lovecraft, Edited by S.T. Joshi. New York, NY: Hippocampus Press; 2006; ISBN 0-9761592-2-8 (hardcover) 0-9761592-3-6 (paperback), 382 pages. This book may be purchased in hardcover from Amazon.com or Barnes & Noble, in paperback from Amazon.com or Barnes & Noble, or directly from the publisher, Hippocampus Press.